The joint solution will enable digital signage technology users to quickly generate and publish interactive content for a range of digital signage applications. 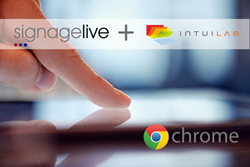 Signagelive, global suppliers of cloud-based digital signage technology, announced it is working in collaboration with IntuiLab, leading suppliers of a content creation platform for interactive experiences, to expand the reach and functionality of Google Chromeboxes for digital signage usage. The new partnership will give both companies greater visibility globally and the possibility to secure new opportunities in retail and hospitality markets where interactivity is key. IntuiLab’s innovative content creation platform has been built from the ground-up with multi-touch capabilities at its core, enabling users to create highly interactive experiences that can be deployed on any touch-enabled display without needing HTML5 coding knowledge. Signagelive is incorporating IntuiLab’s multi-touch capabilities into its core digital signage platform with optimisation for its Signagelive for Chrome offering to create a powerful and engaging digital signage solution that is low cost to deploy and economical to run. The joint solution will enable digital signage technology users to quickly generate and publish interactive content for a range of digital signage applications. Retailers and their respective content agencies, for example can easily create touch enabled content for displays located strategically around a store to encourage impulse purchasing. Furthermore, this content could be linked to Signagelive’s Proof of Play and proactive monitoring tools that are ultimately connected to EPOS systems, thus further enhancing overall sales activities and measuring ROI. In addition to IntuiLab's multi-touch content, Signagelive for Chrome provides full support for formats including static images, HD video, web pages, IPTV, multi-zoning for different media types, image layering, RSS feeds, portrait support and screen on and off control. Signagelive is a private company that has been supplying digital signage software and services across all vertical markets including; retail, education, fast food, hospitality and private enterprise since 1997. The company is now a world leader in the development and delivery of digital signage applications and interactive media solutions. Its core management and media playback software is cloud-based and is compatible with an unrivalled number of display screens, from mobile devices and tablets to mega HD video wall display systems. Signagelive is headquartered near Cambridge in the UK. It has subsidiary offices in Chicago and Singapore and provides its digital signage solutions through an established network of resellers, distributors and strategic channel partners in EMEA, Americas and Asia Pacific. Signagelive’s innovative technology is currently powering digital signage applications for single devices through to the largest digital media networks reliably, efficiently and cost effectively to thousands of customers in over 30 countries worldwide. IntuiLab makes IntuiFace, the world’s premier platform for creating, deploying, measuring and managing deeply interactive, connected and expressive digital experiences without writing code. It is used by thousands of users in hundreds of companies across 55+ countries to build experiences driven by mobile devices, multi-touch displays, Microsoft Kinect gestures, RFID/NFC readers, the Internet of Things and much more. For any industry – including retail, hospitality, real estate, tourism, education – and for any intent – from digital signs to self-service kiosks and assisted selling. More at http://www.intuilab.com.